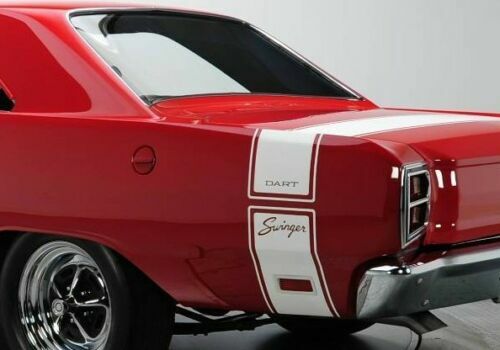 1969 Dodge Dart Bumble Bee Stripe - Stencils And Stripes Unlimited Inc.
1969 Dodge Dart Bumble Bee Stripe The 1969 Dodge Dart Featured a wrap around stripe with a accent stripe located on the outside of the stripe. The kit consist of five sections Left & Right Upper and Lower Quarter Panel section and trunk lid stripe. Our kit includes a vinyl application squeegee and 3M vinyl application sheet. This kit is available in the factory colors Gloss Black, Red, White along with Matte Black and for those wishing to paint their stripes on a paint stencil kit. Once the lower quarter panel stripe is applied the area for the marker lamp can be cutout. NOTE: Although shown in the photo the Dart Bumble Bee stripe the stripe is plain with no callout.